As the final notes of the national anthem faded over Charlotte (N.C.) Motor Speedway’s public address system last May, amid the cheers of the crowd ready to watch NASCAR racing, Stewart-Haas Racing’s (SHR) Clint Bowyer paused before climbing into his racecar to run 600 miles in one of the biggest events of the year. The driver noticed tears in the eyes of Terry Wagoner’s family standing in front of his car. Bowyer had met the Wagoner family of Pelzer, South Carolina, earlier in the day as part of NASCAR Salutes – the industry’s collective expression of respect and gratitude for members of the U.S. Armed Forces, past and present. Bowyer would carry the 28-year-old Wagoner’s name on his windshield header during the race. Wagoner and two others died in Baghdad, Iraq, in 2007 from wounds sustained when an improvised explosive device detonated near their vehicle during combat operations. Wagoner was in his second Iraq tour when he was killed. He followed in the footsteps of five uncles who also served in the military. 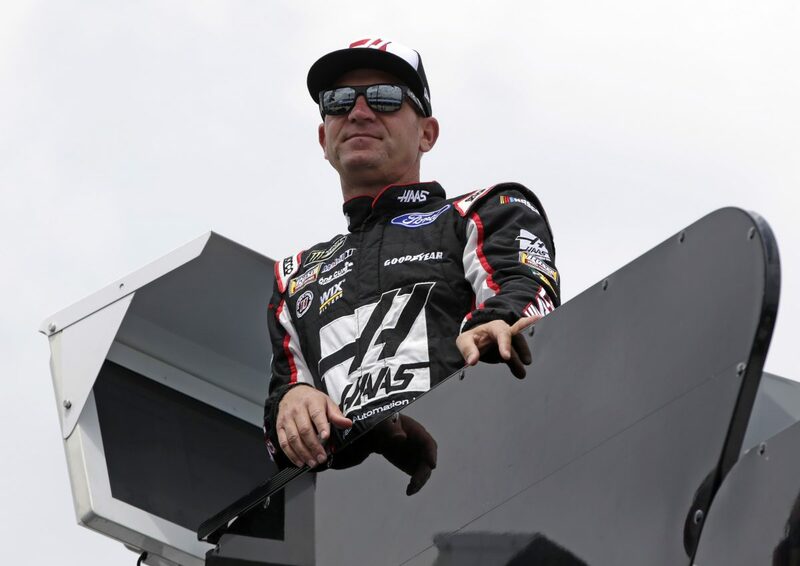 It had been smiles and laughs at the meet-and-greet that morning when the Wagoner family visited Bowyer at his motorhome, but the solemn prerace ceremony that included a moment of silence and national anthem brought out their tears. Amid the tension and chaos of prerace activity, Bowyer walked over to the family to give each a hug and whispered some words into their ears. Nobody outside the family knows what was said but, if there is a family that identifies with the sacrifice a soldier and his family make for their country, then it’s the Bowyer family of Emporia, Kansas. Clint’s paternal grandfather Dale E. Bowyer was a 1st Lieutenant in the United States Army. He won the Purple Heart, Bronze Star and Distinguished Service Cross for extraordinary heroism while fighting the armed enemy in Germany during World War II. The Distinguished Service Cross is the second-highest military decoration that can be awarded to a member of the United States Army. It is awarded for extraordinary heroism. While leading his platoon under heavy fire in an attack near Sinz, Germany, on Jan. 25, 1945, Lt. Bowyer was severely wounded by an enemy mine. He refused evacuation even though both feet were shattered. He shouted instructions and encouragement where he lay. Inspired by his bravery, the men re-formed, moved clear of the mine field and continued the advance. Only then did Lt. Bowyer allow himself to be evacuated, crawling clear of the mine field to avoid injury to people. “His devotion to duty and to his men, and his courage and fearless determination, are in keeping with the highest traditions of the military service,” read the commendation he received. Lt. Bowyer eventually lost a leg due to his injuries. After his career in the Army, he lived in Iola, Kansas, and worked in the dairy business. He passed away in June 1974. Bowyer never met his grandfather. This Sunday in the Coca-Cola 600, his grandson Clint Bowyer will carry the name of New Hampshire National Guardsman Spc. Alan J. Burgess of Landaff, New Hampshire, who died in Iraq after a car bomb went off near his patrol in 2004. The 24-year-old father of one was on patrol as a vehicle gunner in the northern Iraqi city of Mosul when he was struck by shrapnel. Burgess was a member of the 2nd Battalion, 197th Field Artillery Forward, headquartered in Berlin, New Hampshire. Whether he wins or finishes last Sunday night in the Monster Energy NASCAR Cup Series Coca-Cola 600, Bowyer won’t forget the sacrifices his grandfather and family made to keep America free or the ultimate sacrifices of the Wagoner and Burgess families and thousands of others across the country and throughout history. That’s the meaning of Memorial Day. What are your thoughts on the service of your grandfather and others in the military? Do you notice the extra 100 miles in the Coca-Cola 600? Is there a difference between your mental approach now that you have a victory in 2018? Are companies more interested in the No. 14 with the success you have enjoyed in 2018?